Pancakes are for life, not just for Shrove Tuesday. Until two or three years ago I was a strong believer in the idea that pancakes should only be eaten on Pancake Day. For some silly reason I thought it made them extra special – a real treat. But I am so glad I changed my mind because who doesn’t love eating pancakes all year round! 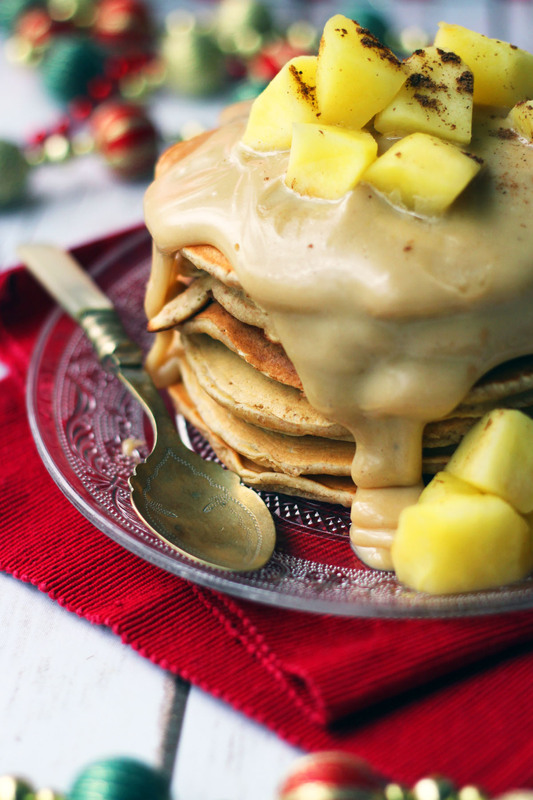 These Cinnamon and Apple Pancakes with Caramel Sauce are oh so indulgent which makes them perfect for a special breakfast for Christmas morning but are also fantastic the rest of the year. The key to these Cinnamon and Apple Pancakes with Caramel Sauce is to ignore all your healthy, dieting instincts. You’re going to need butter, sugar, cream and lots of other naughty ingredients. The apple is of course one of your five a day…until you stew it in the butter. But they’re so light and fluffy with a sweet ,sticky sauce and sharp, sour apples you’ll soon forget about the quest to fit into your New Years Eve dress! So grab a fork and tuck into these fluffy, American style pancakes. And don’t forget the cinnamon! 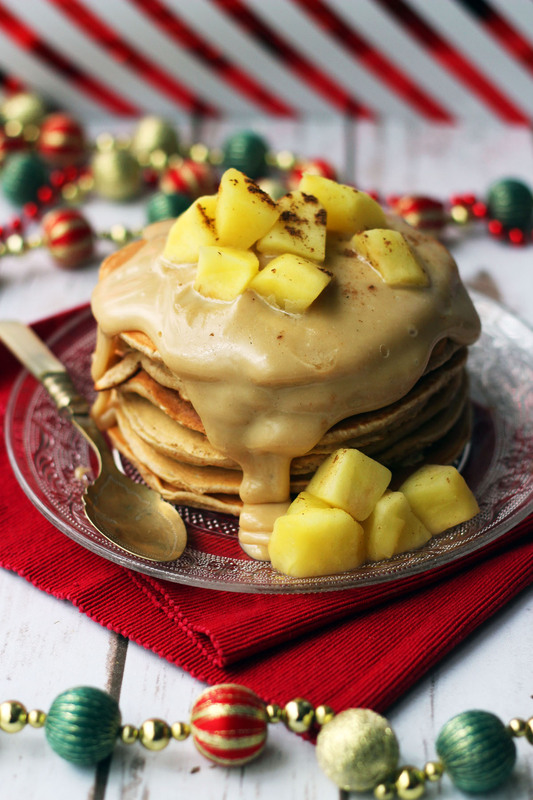 These cinnamon and Apple Pancakes are drizzled with a decadent caramel sauce - the perfect way to start Christmas Day! Begin by making the caramel sauce so that it has time to cool slightly before serving. Heat the sugar and water slowly in a heavy bottomed pan. Once the sugar has dissolved boil the sugar water rapidly until it goes thick and golden. Immediately take off of the heat and pour in the cream, then swirl until the cream and sugar have mixed together forming a silky smooth sauce. Transfer to a jug and allow to cool whilst the pancakes cook. In a large bowl, whisk together the egg, milk, melted butter, sugar, cinnamon and flour until a smooth, thick batter has formed. Heat a small non-stick frying pan before pouring a large ladle of the batter into the pan. Cook the pancake on a high heat until you can see bubbles forming on the top side of the pancake. Give the pan a good shake to release the underside of the pancake and flip. Cook for another 2-3 mins before transferring to a warmed plate. Cook each pancake in this way and keep them warm until you are ready to serve. Before serving the pancakes, peel and core the apple then dice into pieces roughly 1cm cubed. Melt the butter in the pan with the sugar and stew the apples until they are hot and tender. Serve over the pancakes with the cooled caramel sauce and sprinkle with a little cinnamon. Sometimes there really is no better way to wake up than to the smell of pancakes cooking on the stove. A day is instantly made better with a special breakfast just like this. So why not make them for the most special day of all – they are the perfect Christmas breakfast. What will you be treating the family to on Christmas morning? Love the cinnamon apple and caramel combination here, so very festive. It helps in getting into the mood. It’s definitely not a breakfast you want to share Helene 😉 glad you like it! This looks amazing! Especially that caramel sauce, wow! Thanks emily. Making the sauce yourself makes all.the difference! This is just a wonderful way to start the day! How delicious and love the caramel sauce. Thanks Sandhya breakfasts really dont get better than this! I’m often making Banana and Cinnamon pancakes.. Didnt’ think of Apple! I bet it tasted delicious..! Would be such an amazing start to a long day.